Along the Gulf of Mexico, Naples is a city not only recognized for premier dining and shopping, but it’s also the perfect animal-friendly destination for pet-parents seeking to bring their four-legged friends for a getaway. In this amazing pet-friendly city, there are many hotels you and your playful pups to stay. The Ritz-Carlton Hotel, a Mediterranean-styled golf resort, will rolls out the red carpet for your canine with a wide range of services, from plush beds, treats, and toys to pet nanny services for guests who want to head out and ensure their pups are taken care of! This is the perfect sanctuary to relax when not exploring Naples with your dear pet! The hotel also takes pride in showcasing the Tiburón Golf Club, founded by Greg Norman, an athlete with 79 career victories, three-time Vardon trophies, two-time British-Open victories, PGA Player of the Year Winner, and the three-time recipient of the Arnold Palmer Award for Leading Money. Tiburón means shark in Spanish, but don’t worry, in this a gorgeous golf-course, you can indisputably take a walk your dog along all 18 holes on the pathway, the only think you have to be cautious of are the golf balls! 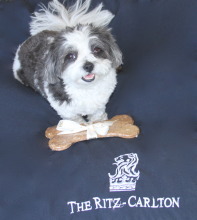 Dogs are Very Important Pets at the Ritz Cartlon! When staying at the Ritz-Carlton, make sure you eat at The Poolside Grill, where they keep a pet-friendly area, and taste a blend of international cuisine and all-American favorites, without missing a second of Florida sunshine! At the Naples Bay Resort, the ultimate escape for the boating pet lover, it’s as good as it can get! 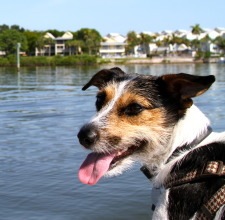 This other pet-friendly hotel, at a waterfront setting, allows up to two pets per rooms and includes a pet-friendly package called the “U Nauti Dog.” This package includes a cozy bed, bowls, dining bowls, Wagatha’s organic treats for healthy pets, pet mitts, and a Naples Bay Resort bandana, along with a list of animal-welcoming businesses, beaches, and parks for pet-parents and their pups to enjoy. 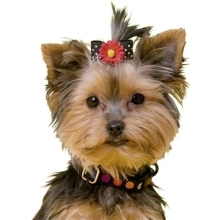 At the Naples Bay Resort, pets will also enjoy a “pupcake” at Sassy Cakes, and will be served a cool drink while relaxing on the patio at Fred’s Food, Fun, and Spirits, named after the hotel owner’s dog! It’s as good as it can get! For pet-parent on a tighter budget, the Red-Roof Inn in Naples is a great place for you and your pup to stay. Pets are also welcome to stay (free of charge!) at over 350 other locations. This hotel is entirely dedicated to animal lovers and their furry friends, and you should not hesitate on taking them with you anymore! If you and your pup yearn to hear the call of the wild, the two of you will love the waterfront view from the screened-in patios at the River Wilderness Waterfront Villas, in Everglades City. Often considered a walk back in time, the Everglades reflect the earlier times before Florida’s development boom. Sub-tropical species are everywhere, and the Manatee can be sited outside of River Wilderness Waterfront Villas. Your pooch might appreciate a little doggie-manatee nose-boop! Don’t worry about looking for pet-friendly restaurants, Naples has tons of them! As Florida is blessed with a wonderful year round weather that allows customer to sit outside, pet friendly restaurants are becoming common! Thank Dog! Here is a list of local restaurants for people and pets to find delicious food to cater their appetites. Pincher’s Crab Shack is one place to visit for seafood. Try their freshly delivered crab, fish, and Florida stone crab claws in season every morning from the Gulf of Mexico. This restaurant not only provides some of the freshest seafood in Southwest Florida, but also has fabulous seating overlooking the water at Tin City. Your pooch will have a nice view to contemplate while you enjoy your meal! For Italian food lovers, Barbatella, a spirited Italian trattoria, offers an extensive menu with authentic dishes such as roast duck, smoked pork baby-back ribs, and Venetian-styled meatballs. After you’ve enjoyed the old favorites, Barbatella also offers for dessert homemade Italian ices, gelatos, and sorbets. You and your pooch will have a wonderful time there. If you liked Barbatella, you will love its sibling restaurant, the popular Sea Salt, also founded by Chef Fabrizio Aielli. Named Best New Restaurant by Esquire Magazine, this place is known for using organic and local produce, along with catching wild seafood and raising poultry and meat without antibiotics and hormones. 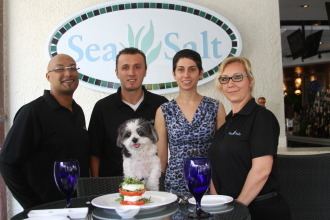 With an animal-friendly vision by a chef, Sea Salt and Barbatella are two restaurants that are irresistible to pass up when visiting Naples with your four-legged companion! Another local favorite place to try while staying in Naples with your pet is M Waterfront Grille, with its contemporary, engaging, cutting-edge cuisine with a focus on fresh seafood, steaks, hand-made pasta, organics, and tapas plates that you and your pup is sure to enjoy in a pet-welcoming atmosphere on the restaurant’s front veranda. When you are not lounging and relaxing at your hotel or enjoying a delicious meal at the restaurant, you need to find places to go where both you and your pup will be welcome! For city-dwellers, there are a ton of local events for you and your pet to enjoy on a lovely Florida day. 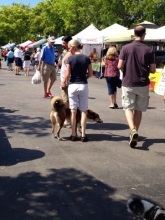 The Third Street South Farmer’s Market takes place every Saturday morning, year-round, and is the perfect opportunity to take your canine out for a morning stroll, while purchasing goodies such as dog treats, prepared foods, jams, relishes, and palm baskets made on the spot. The City of Naples Dog Park is also a fabulous place for pet-parents and their pooches to play outdoors together. The 1.3 acre park includes two separate leash areas for playful dogs to stretch their legs and run around; one for larger dogs, and a second one for smaller dogs. This puppy paradise also provides a shade structure with benches, and drinking fountains for man and pets. 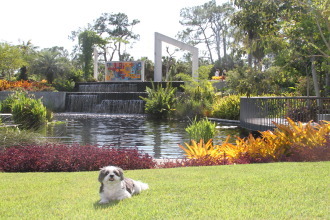 Nature lovers and their pets can enjoy the beautiful plants and cultures in the Naples Botanical Gardens. Families and the furry members can visit the 170-acre garden paradise, and enjoy an educational experience for audiences in a canine-friendly atmosphere, with a Children’s Garden, walking trail, and a Butterfly House. There is even a yearly Dog Day, geared towards man’s best friend, which features pet-friendly vendors, doggy pools, and treat stations for pups to play and socialize. After some outdoor bonding time, no day is complete without a shopping spree for your beloved pet! For pet-parents on the hunt for Betsey Johnson-inspired outfits designed by Jackie Gross for furry fashionistas, Fergie’s Closet Doggie Boutique, at the Naples Bay Resort, has amazing uniquely-printed aqua polka-dot, rhinestone, and crystal collars, along with organic treats for their canine customers. With bright and colorful dresses that have fun names like the summer-ready “Tropical Burst Harness Tutu,” and the patriotic “Stars and Stripes” dress, which are steals at only $45, these outfits truly make a fashion statement at an affordable price. If can’t bring back in your suitcase some of your furtastic finds, Fergie’s Closet website provides shipping services! Or you could also come back!! 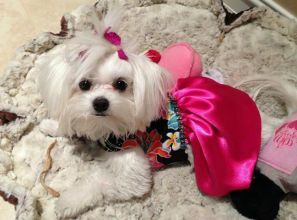 Jackie, Fergie’s Closet designer, is the Bestey Johnson of pet fashion! Another fantastic pet boutique in Naples that will fulfill your pet’s dreams of luxury is Pucci & Catana, your new ultimate pet shopping location! You will find there everything from couture collections to organic toys, and also exciting seasonal accessories to help you avoid embarrassing fashion faux paws! If you need dog food while in Naples, you can visit For Footed Friends, the finest natural pet food store in the Naples area. You will find there all kinds of natural and holistic pet food, for dogs and cats alike, as well as treats, vitamins, and supplies and travel accessories for your pampered pet! 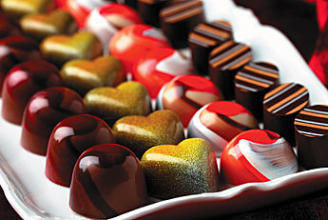 Before leaving Naples, stop by the best chocolatier and award-winning Norman Love Chocolate Salon for signature gourmet hazelnut praline, cherry cordial, vanilla cupcake, and white chocolate truffles, but remember! No chocolate for your dog, ever! It’s toxic! Dogs are not allowed inside, but you can enjoy your treat on the terrace. Make sure you bring some dog-friendly treats for your pup, so Fido doesn’t feel forgotten. With artistry in chocolate, founder Norman Love, received the honor of one of the “Top 10 Chocolatiers in North America” by Dessert Magazine, along with being one of 18 chefs selected to make a birthday cake at the 150th Smithsonian Anniversary in Washington D.C. Norman Love’s confections have been featured by USA Today, The Today Show, Robb Report, InStyle, and Entrepreneur magazine, and will leave chocolate lovers with an unforgettable experience. No chocolate for your dog! Ever! 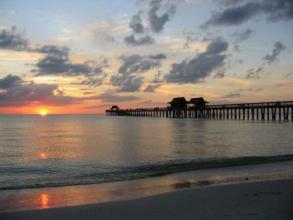 Marco Island is located on an island by the same and is a principal city of the Naples–Marco Island Metropolitan Area. It is the largest barrier island within Southwest Florida’s Ten Thousand Islands area. The Ten Thousand Islands, which despite their name only number in the hundreds, are a chain of islands and mangrove islets. These rich habitats attract hundreds of species of wildlife. When on Marco Island, the family-owned Boat House Motel will help you and your pets feel right at home and refreshed in rooms that accept three pets of any size. This charming oasis offers a peaceful environment, along with fantastic panoramic water views of manatees, dolphins, and fish on the Marco Rivers. When it’s time to eat, CJ’s on The Bay is a Marco Island restaurant that will give customers a breath-taking sight, while catering to your pet. This pet-friendly hidden gem lets you sit with your pooch at the outdoor bars and tables, and the staff will bring your dog fresh water in a doggie dish of fresh water while you relax in the Florida sun. 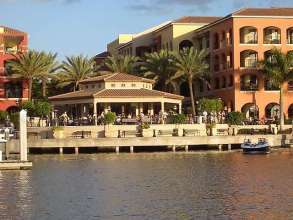 CJ’s on The Bay also features a full-service outdoor gazebo bar and restaurant, along with an expansive menu to compliment the fabulous ambiance. CJ’s On The Bay gives customers a breath-taking sight! We know you are always in for an adventure! You and your pet can go on a boat tour to Keewaydin Island along one of the top secret beaches in the south, and a sanctuary for wildlife and recreation. Dogs are welcome on the boats; but make sure you stop by Fergie’s Closet to get a lifejacket also at the Naples Bay Resort. While visiting Keewaydin Island, pooches can enjoy the outdoors and view the unique Frigate birds, these amazing travelers who migrate from the Galapagos Islands. Keewaydin Island is a unique and enjoyable experience for vacationers and their leashed dogs, who are allowed to run along the white sand and clear water. Your dog will love a nice boat ride! During the summer boat rides, animal lovers can spot as many as 10,000 wading birds roost on a small island in Pumpkin Bay. Female loggerhead sea turtles drag themselves onto refuge beaches to nest and manatees feed within the estuary, and diverse species of birds can be spotted there too, including, wintering waterfowl, bald eagles, and the rare mangrove cuckoo and black-whiskered vireo make their home on the mangrove along with the diamondback terrapin. 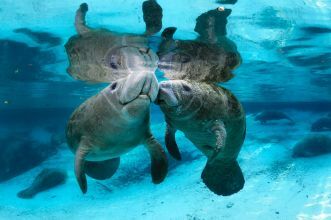 In the Ten Thousand Islands you can spot many gracious manatees! Not a pet-parent yet? Adopt! 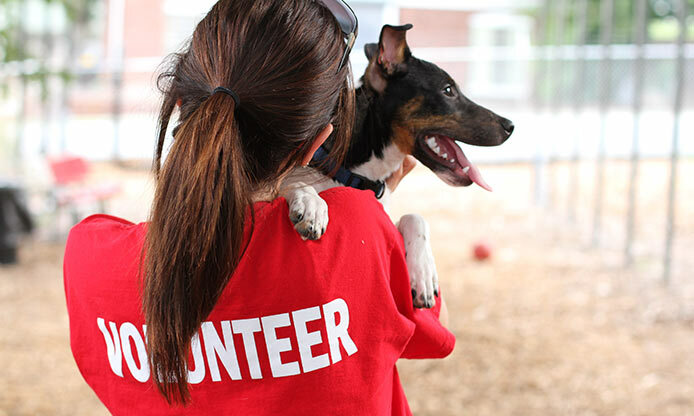 In Naples, there are many places to adopt a new friend for non-pet parents, or for those looking to add a new four-legged member to their family. A few places to contact are the Humane Society of Naples, Brooke’s Legacy Animal Rescue, and the Collier County Domestic Animal Services. Naples is a marvelous location that gives vacation-goers and their pets the luxury getaway they deserve, and has many places that caters to pet-parents and their furry family members. For anyone looking to bring their playful pup on an eventful and adventurous vacation, Naples is the “purrfect” pet-friendly city to explore! Previous articleAdopt Me! Bring Scout Home Today!